Past, Present & Future | Boston Street Railway Association, Inc.
For this young transit enthusiast, taking a ride above the streets of Charlestown, or hopping aboard a streetcar at Lechmere bound for Clarendon Hill are things experienced only through video, photograph, and word of mouth. But in celebrating these memories of “transit past,” we recognize the significance of “transit present,” and preserve our memories of the experiences we have while riding the MBTA. In turn, we pass them on to a new generation, riding the system as they know it decades from now. 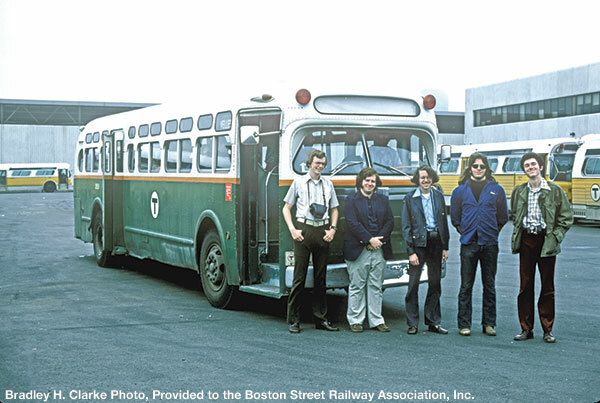 Attendees pose on a BSRA fantrip in front of an ex-Eastern Mass. Street Railway GMC bus, June 15, 1975. While we grimace and gripe about the woes of commuting, or the trials and tribulations of the MBTA, we should also remember that we are experiencing what may be a major changing point in local transit history. Just as the Boston Elevated Railway became the Metropolitan Transit Authority, and the MTA in turn became the Massachusetts Bay Transportation Authority, the MBTA as we know it today may soon become another name in the long line of local transit entities. With that will inevitably come changes in service—both good and bad—and new types of thought and visions for the future of transit operations in Boston. A group shot at Watertown Square on the BSRA’s “Farewell to the Flyer Trackless Trolleys” fantrip, May 2, 2009. The streetcars, buses, and trains we ride on today will one day be relics of the past. The fan trip operation of a Type 7 streetcar, RTS bus, or 01600 subway car will trigger memories of our own “heyday” of transit operations here in the historic city of Boston. And while we cannot keep today’s vehicles operating indefinitely, we can take a cue from the founders of this very Association, who banded together to rescue a Type 5 streetcar from the scrap heap in 1959. The footsteps of passengers were barely wiped from the floorboards when that streetcar was saved, but today, fifty years later, it survives as a veteran of several generations of transit operations—and Bostonians as a whole. Its future operation will pass on the experience of early- to mid-Twentieth Century Boston commuting to generations to come of regular riders and railfans. Likewise, the preservation of today’s vehicles and events will give the experience of commuting at the turn of the 21st century to future transit enthusiasts and the riding public. As the restoration of 5706 nears an end, the work of the Boston Street Railway Association, its sister organizations, and their supporters is far from completed. We must build from our publications, the restoration of our streetcar, and the educational opportunities that the BSRA has provided so successfully in its first fifty years, and carry it onward into the years to come.